The National Electric Drag Racing Association (NEDRA) exists to increase public awareness of electric vehicle (EV) performance and to encourage through competition, advances in electric vehicle technology. NEDRA achieves this by organizing and sanctioning safe, silent and exciting electric vehicle drag racing events. NEDRA is a coalition of drag racing fans, electric drag racing vehicle owners and drivers, individuals interested in promoting the sport of EV drag racing, EV parts suppliers, EV manufacturers and other environmentally concerned companies and individuals. Working together as a group, we put excitement into electric vehicle drag racing. 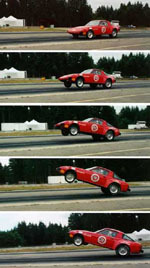 Shown to the right is the electric Maniac Mazda doing a wheel stand. Leapin' 'lectric vehicles! In March of 1996 after the EVTC and APS sponsored Saturday Night Electric Drags at Firebird International Raceway a small group of ampheads met at a local pizza eatery. They talked of forming an electric drag racing association over a few beers and pizza. In the spring of 1997 ampheads from around the country gathered in the Wilde Evolutions' offices in Jerome Arizona for two days of intense meetings to iron out the bylaws and class divisions. Present were John "Plasma Boy" Wayland from Portland Oregon who became NEDRA's first President, Roderick "Wildman" Wilde who became Vice President, Lou Tauber from Portland Oregon, who became the Secretary/Treasurer, Bill Dube, an engineer from Denver Colorado who became the National Tech Director who wrote all the safety rules, and Dean Grannes and Stephanie Matsumora from Fremont, California who took on the duties of webmaster and membership secretary. Dennis Berube also showed up to give his input. This was the beginning of NEDRA which is still growing today and putting on EV drag racing events around the country. In 1999 Bill Dube and Roderick Wilde lobbied the NHRA to include electric cars and electric motorcycles in NHRA racing. The NHRA had a rule in their book since their formation in 1953 that you must have an internal combustion engine. The new rule allowing electrics was approved and was first published in the 1999 NHRA rulebook. In 2012, NEDRA became an NHRA Alternative Sanction Organization (ASO). The IHRA accepted electrics into their rules. NEDRA also joined the SFI in 2012 to collaborate on safety for electric racing vehicles. NEDRA wrote a first responder document for EV racing that has been adopted by the SFI and FIA for training drag racing professionals. Coordinate a standard rule set for Electric Vehicle Drag Racing, to balance the needs and interests of all those involved in the sport. Educate the public and increase their awareness by dispelling the popular misconceptions surrounding EV's. Have fun in a safe and silent drag racing environment. Feel free to contact us for any further information you may need concerning the National Electric Drag Racing Association. You can email any of our Board Members, listed above.